Hey guys! Laura here. To celebrate Mom’s blankety-blank birthday (gotta keep ‘em guessing), I took her to the new MGM Grand at Foxwoods for a delicious lunch at Junior’s Restaurant. She wanted to have the whole New York deli experience without actually having to drive all the way there. With gas costing around $45 a gallon these days, we decided that Connecticut was far enough to drive for a corned beef sandwich. I was able to score a fabulous parking space right near the door without having to stalk or harass anyone. Mom had birthday luck on her side, and I knew it was going to be a fabulous day. Perhaps we’d even win a little at the slots! Once inside, we made our way through the gorgeous casino and hotel lobby to Junior’s. We were both dying to eat, and really dying to have some of their famous cheesecake. Now we’ve ordered from the Junior’s catalog in the past (click here), but this would be our first experience having a fresh slice of their cheesecake. We couldn’t wait! We were seated at around 1:30 p.m. by a friendly young man who left us with two large menus. Junior’s is a small chain restaurant that serves everything that a traditional New York deli would: Matzoh ball soup, smoked salmon (lox), corned beef and pastrami sandwiches, potato pancakes, beef tongue, chopped liver, and many other typical Jewish delicacies. They also serve mainstream meals like Buffalo wings, hummus plates, baby back ribs, fish and chips, steak, and so many mouth-watering dessert choices. The restaurant has a very clean, modern look and can seat quite a lot of people. I can’t even begin to imagine how busy Junior’s gets at night. Mom and I had done a little planning at home using their website so that we could figure out the best way to have both lunch and cheesecake. When our waitress – Stefanie – arrived, we ordered two cans of Dr. Brown’s Diet Cream Soda. She brought the cans over with two large glasses of ice. Also brought over were a cup of beets and another cup of cole slaw with pickles on top. Since Mom hates all things vegetable, I ate these cold little appetizers and they were very good (although the cole slaw could have had a bit more flavor). For lunch, we decided to split a traditional corned beef sandwich on rye with Swiss cheese and mustard. This would not be my first experience with corned beef, but Mom was new to this meat. She had been dying to try it so we figured that now was the time and Junior’s was the place. When it arrived, it looked just as I imagined. Thick layers of corned beef were topped with melty Swiss and stuffed between two slim slices of rye bread. The mustard was on the table, so I added it to my sandwich but Mom decided to hold off. As we were eating it, I noticed that Mom’s excitement over the meat seemed to disappear. “Are you enjoying it?” I asked. “Well … yes and no,” said Mom. “I like the taste, but not the texture.” I agree with Mom one hundred percent on this one. Prior to her acting weird while eating her sandwich, I had to rip off a big hunk of dripping fat from the edge of my half. Not appetizing at all. However, that’s corned beef for you. It’s almost impossible NOT to have fat somewhere within the meat. That’s the reason why I don’t eat pastrami. Love the taste; hate the texture. With lunch and Mom’s corned beef adventure behind us, we decided on dessert. We had split a sandwich because we each wanted to get our own piece of cheesecake and didn’t want to fill up on something nutritious (ick). We decided to get a pineapple topped slice and one with a chocolate swirl. When Stefanie brought them to the table, we cut off a piece of each so that we could try both. They were absolutely amazing! You haven’t had cheesecake until you’ve had a slice of real New York cheesecake. It was stuck-to-the-fork thick, creamy, cheesy, and flavored just perfectly. The chocolate swirl did not overpower Mom’s slice, and the pineapple topping gave my piece an extra kick of flavor. Boy do we miss them. Pricey! Stefanie’s 20 percent tip came to $6.42 and with Mom’s birthday luck running high, I somehow ended up with exactly that amount left over from what I’d put aside for the meal. We were on a lucky streak, so it was time to hit the slot machines. Unfortunately, that’s where our luck ended. Although we were able to play for a while, we left empty-handed. Tired and broke, I went back to Junior’s to get two of their famous egg creams to go. What’s an egg cream, you ask? Well, the traditional way to make it is to put in a little U-Bet chocolate sauce, a little milk, and a lot of seltzer water. Mix ‘em all together and you have an egg cream … without the egg. Apparently eating raw eggs isn’t healthy anymore, but restaurants back in the day used to plop one in which is how the drink got its name. Mom waited for me outside by the large water fountain watching tourists take pictures. The drinks were $3.50 each and the total was $7.44 with tax. Not cheap, but then again, the restaurant is at a casino. Nothing is ever cheap at a casino. The egg cream was really good. It reminded me of chocolate soda. The only problem we had with it was the temperature. I wished that the waiter had put ice inside, but apparently ice is not an ingredient in an egg cream. I personally think that it would have been a little better if it were cold. Even though it turned out to be an expensive day, it was all worth it. We had a great meal at Junior’s, a fun time playing Wheel of Fortune on the casino floor, and Mom had an excellent birthday. Both Mom and I each have a list of things that we want to get on our next visit to Junior’s, but we’re keeping our distance from the corned beef. This Junior's location is open from 7 a.m. to 11 p.m. Sunday through Thursday, and 7 a.m. to 2 a.m. Friday and Saturday. Breakfast is until 11:45 a.m. and lunch is until 4 p.m. There is also a separate coffee kiosk located outside of the hotel lobby off the casino floor that is open 24 hours a day. 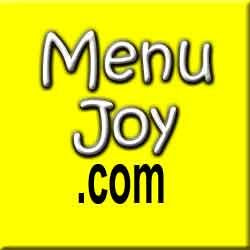 Be sure and visit our friends at MenuJoy.com for great area restaurant menus.